I love to travel. I love everything about seeing new places in the world, meeting interesting people, tasting new foods, AND getting a great deal in the process. I’ve had many conversations with friends and family about my travels – and they’re always shocked at the low prices I’ve paid for my trips. They wonder how I’m able to find such great deals. Well, here’s a breakdown of how I plan a trip and determine the full, final cost—hopefully it helps you to find a great travel deal, too! 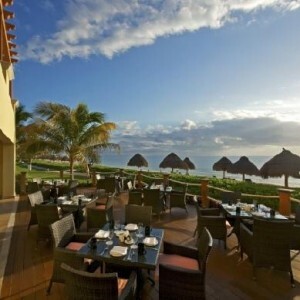 The Cancun area of Mexico always has great deal packages. I personally always travel to an all-inclusive resort. For a budget traveler like me, it’s nice to know that I won’t have to pay more than the booking price, since food, drinks, taxes, and fees are all included. Travelzoo – this is my favorite weekly email blast. Most of my research starts here. They also send out NEWSFLASH emails for deals that are from your home airport. Sherman’s Travel – another good weekly email. Bookit – I’ve found low prices on all-inclusive resorts here. And, I’ve booked regular hotel rooms for Vegas and California. They also have a weekly email alert. Cheapcaribbean – A great site for warm-weather destinations. Sign up for their exclusive deal emails. There are also deal emails available through the big travel websites: Expedia, Orbitz, Travelocity, etc. So let’s talk the Riviera Maya trip… I got an email from Travelzoo, which had multiple deals for warm-weather destinations. What did I do next? 1. I looked up each individual hotel on Tripadvisor and read reviews from travelers. Many times, the deals that come through for the lowest price end up being at hotels with bad reviews. Hence why they are so cheap! My goal for every trip is to find a low price for a great hotel – I ended up selecting Ocean Coral & Turquesa, which gets 4/5 stars on Tripadvisor from more than 3,000 reviews. 2. Once I decided which hotel had the amenities I was looking for (low price, lots of restaurant choices, good beach (not rocky), unlimited a-la-carte restaurants) I then went back to the Travelzoo deal and started punching in different dates. Many times, flexibility with your travel dates can save $100 or more. This particular trip ended up coming to $800 per person, including airfare for a 6-night vacation. I was flexible with my dates, but still was able to get flights with a reasonable layover time and a good arrival/departure time. I always check multiple airports as well, because when you factor in driving time/gas/parking, sometimes it’s worth it to pay $100 more for your vacation from an airport closer to home. 3. I then booked my transportation from the airport in Cancun to my resort. No matter what site you’re booking your trip on, transportation is offered. I usually don’t take the offered transportation, since I know I can find it cheaper elsewhere. PLUS, many times you are in a shared vehicle with multiple stops. When I get to Mexico, I want to get to my hotel as quickly as possible! For example, I usually book with USA Transfers, which is currently $55 round-trip for up to 3 people from the airport to the Cancun Hotel Zone. You don’t have to share your vehicle with anyone, and if you have 3 people, the price comes to $18.33/person. For my trip, we went farther south to Puerto Morelos, so it was $69 for the 2 of us, which comes to $34.50 per person. The web site I booked my trip on offered us transportation for $50/person at booking. By buying with another company, I saved $15/person. Every little bit of savings counts! Parking is something you may not have thought about…but if you take a look at what options there are at the airport, you can save a significant amount of money. For O’Hare, if you take the closest parking option to your terminal, you will pay anywhere from $31-$53 per day. Out a little farther, there are long-term parking lots that range from $8-$17 per day. For my trip, I chose the $8/day option, and paid only $56 for parking. If I didn’t know there was a remote lot to park in, I could have paid $371 for parking. I always do my research and will do a little more work (take a bus to the train to the terminal to save some money. So how much did this trip end up costing, you ask? With all costs included, this trip was about $900 for nearly a week of fun in the sun. I’d love to hear your comments about other great travel deals you’ve found! 2 Responses to How to find great Spring Break deals online: I did it – you can too!